Arranging bookshelves can be tricky. However, there are some basic steps to remember and the rest is left up to the eye. 3. Finish with the details. 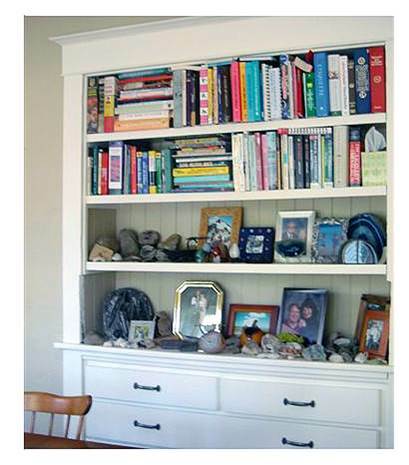 Add pictures and/or mementos that make your bookcase unique and personal to you. Here are some examples to help get you thinking! 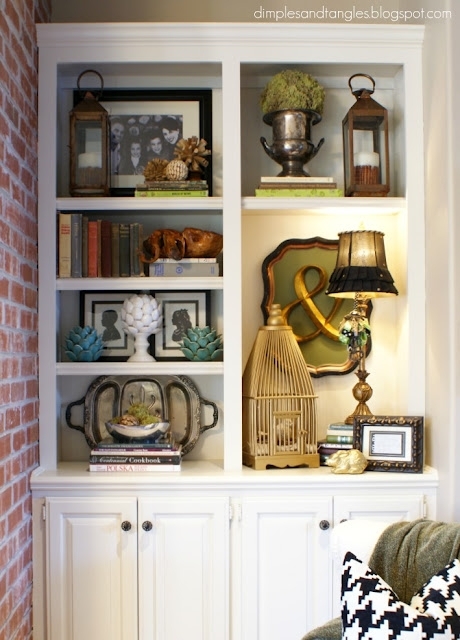 I love how this bookcase’s composition by Cottage and Vine creates a soothing, interesting display. 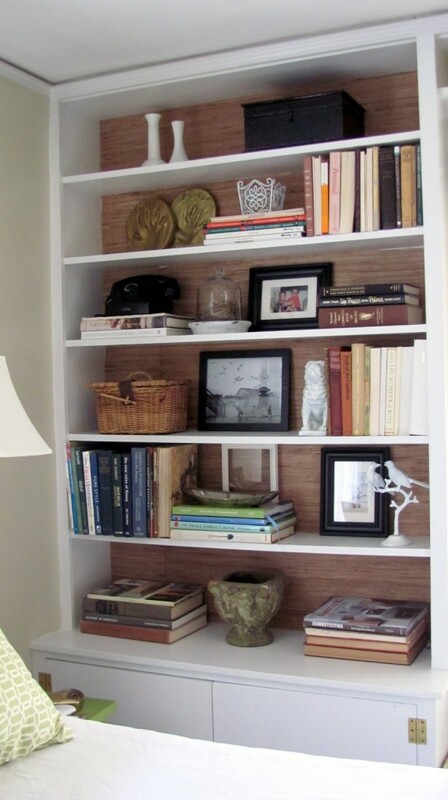 This white bookcase was dressed up with the addition of grasscloth wallpaper at the bookcase back. It adds an unexpected touch to a typical built-in. This is a beautifully styled bookcases by Jennifer of Dimples and Tangles. It has the perfect balance of books, accessories, personal collectibles, and family pictures. The overall setting has just the right amount of accessories- not too much ad not too little. The other interesting part that I love about this arrangement is that two of the shelves on the right side were removed, which allowed for taller accessories to be added. She turned a tray into art by adding an ‘&’ symbol and then hanging it at the back of the bookcase. I love this balanced composition. 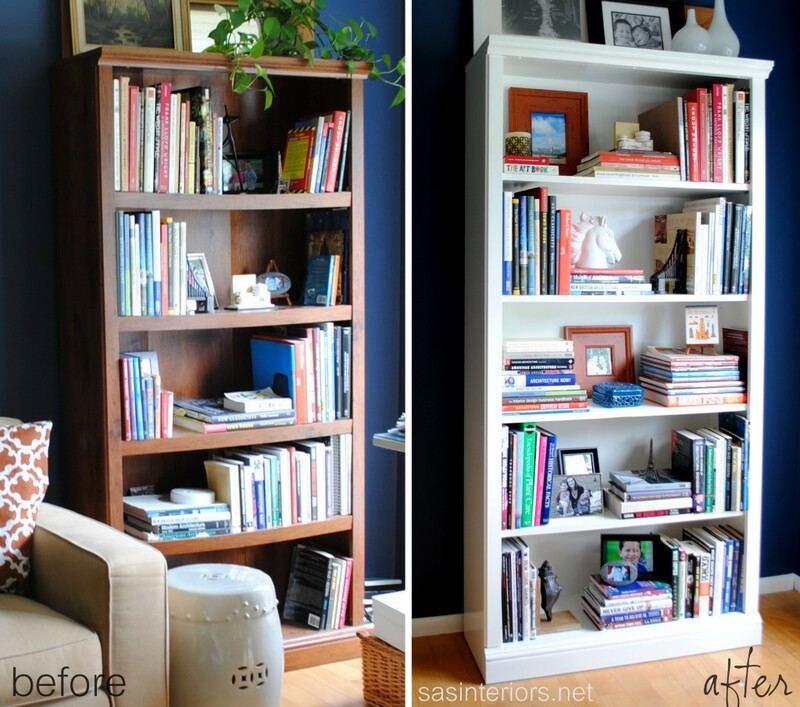 This bookcase, styled by Cassie of Hi Sugarplum, is another wonderful example of how to achieve a well styled bookcase. 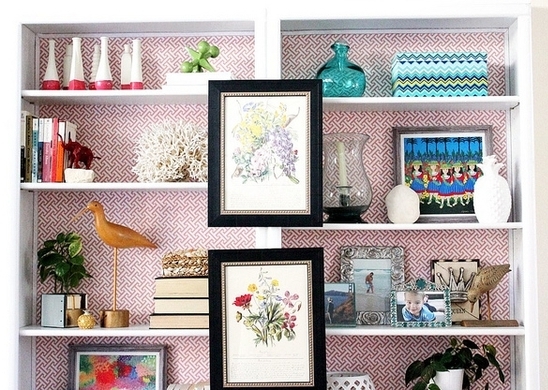 Instead of leaving the backs of the bookcase white, she added a fabric backing with a small geometric pattern; this makes the whole bookcase appear to be a piece of art. Using the same layering technique that I mentioned above, Cassie achieved a great balance between books, accessories, and pictures. There’s not too much or too little of any element. By adding framed art to the bookcase surround, another layer has been added giving the overall bookcase even more depth. 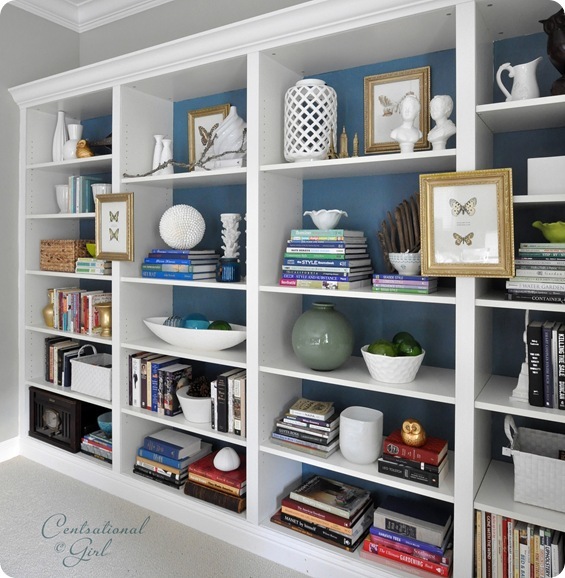 Another great example of a well styled bookcase is this wall-to-wall built-in by Kate of Centsational Girl. 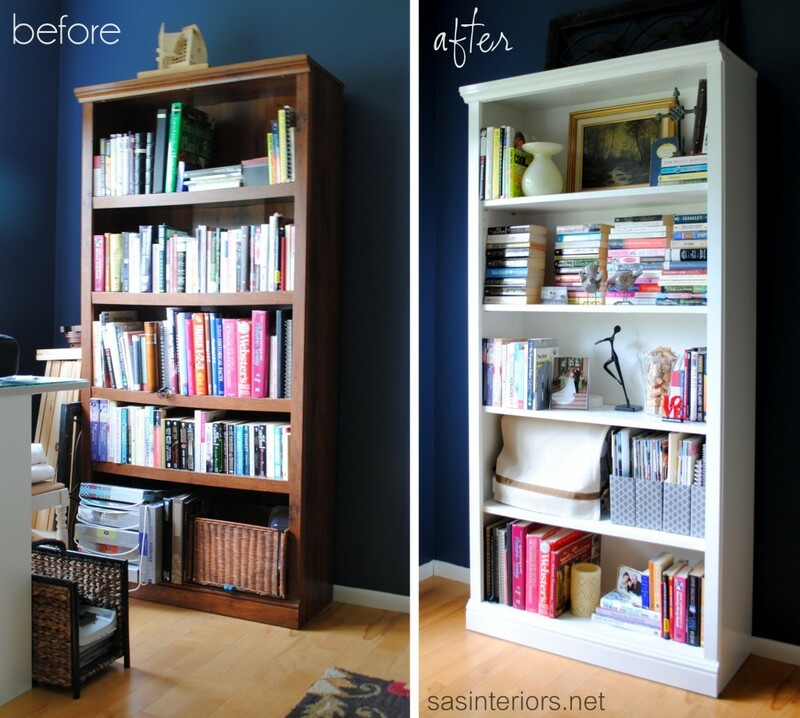 After building this bookcase by using four Ikea Billy bookcases, Kate, instead of wallpapering the backs, like Cassie, decided to paint them which allowed the books and accessories to really stand out. Using a combination of horizontal and vertical layerd books, Kate layered them with ceramic bowls, vases, and personal mementos. She also added framed art to the backs and to the fronts of the bookcase, which like Cassie’s composition, made the bookcase appear even deeper. 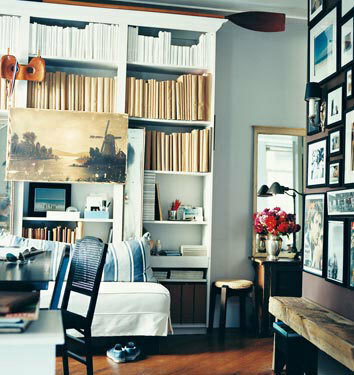 Even if you have a lot of books, go ahead and alternate their position between laying horizontal and vertical, then add accessories throughout as seen on this bookshelf from The Art of Doing Stuff. If you don’t need to access particular books all the time or if you’re really good and can easily identify your books by their spine color, then this could be for you. 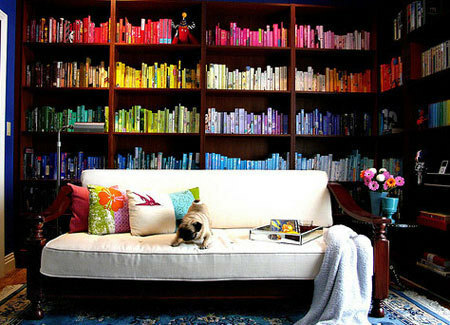 You can arrange them chromatically across a whole bookshelf or arrange them in color blocks. And you can have shelves where you alternate chunks of black and white so it looks like stripes. 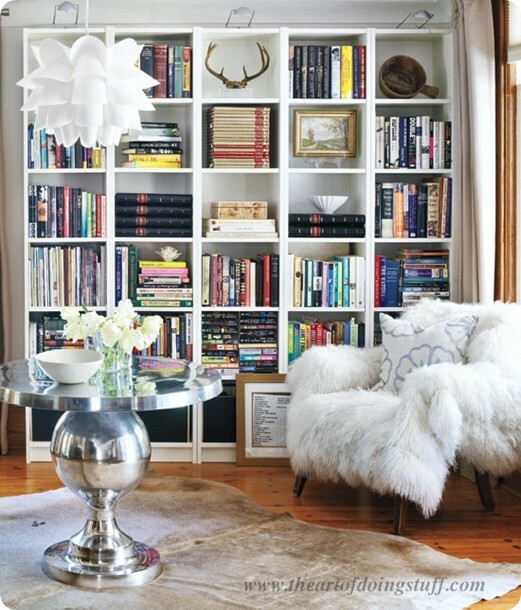 Another way to organize your books is to cover all books in matching paper for a monochromatic look, but be sure to label and organize, unless your library is purely decorative. Hope this has helped and have fun re-arranging! This entry was posted in Design, Organizational Helps. Bookmark the permalink. That color is my love!! !